Excerpted from New Mexico Magazine, January, 1942. To read the original version in PDF format click here. There were many reasons, he says, “But probably the main thing is simply a deep, unreasoning affection for the Southwest.” He likened it to being in love with a woman: “You love her and you can’t help yourself.” They were tired of their gypsy life, “So at last we decided to acquire a base.” He went on to list the other reasons. They had a country mailbox, a picture-window view of Mount Taylor, friendly people who left them alone, and they could do almost anything they wanted, within reason. There was no soot and smoke, and the days were warm and the nights cool. They loved the meadowlarks, rabbits, and quail that visited their yard. More prosaically, Pyle liked that folks here didn’t treat you like a criminal when you tried to cash a check. He also liked it because half his friends didn’t know how to spell Albuquerque. The city was small, the tempo of life was slower; they weren’t “stifled and smothered and hemmed in by buildings and trees and traffic and people.” The Sandías were out their back door. 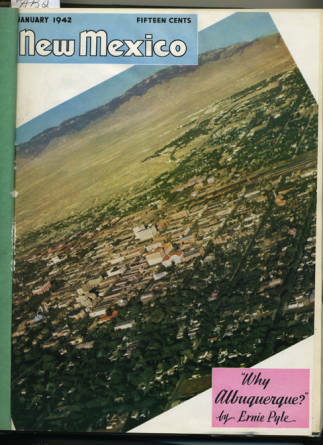 In other words: many of the same reasons people migrate to Albuquerque today. But in 1940, the city’s population was a little over 35,000—about the size of today’s Hobbs. As of 2011, the population was just shy of 900,000. Pyle ended his essay by saying there were lots of nice places where he could live with considerable pleasure, and then he named them; but if he could own only one house, “then it has to be in New Mexico, and preferably right at the edge of Albuquerque where it is now.” Pyle was known to write from the heart, and his affection for Albuquerque seems to have been genuine. Pyle and his wife, Jerry, traveled a lot, due to his profession, and so the house they built in 1940, at 900 Girard Boulevard SE, did not find them at home much. Tragically, Pyle was killed by a Japanese sniper in April 1945, less than four months before the war ended. Born in Indiana in 1900, Pyle left school early to become a cub reporter, and in 1925 he met and married Jerry Siebolds. By 1935 he was writing for the Washington Daily News, but he’d grown weary of the same old grind, so he proposed to Scripps-Howard Newspapers that he write a column so he could “go where I please and write what I please.” His new column first appeared in August 1935. He traveled the country with “That Girl”—which is how he referred to Jerry—interviewing people and honing the skills he would later employ while on the battlefields of WWII. As popular as Pyle was in peacetime, during the war his audience grew to nine million readers; by 1944, his column was appearing in almost 700 papers. He was a “born listener” with a great memory who wrote with “eloquence, compassion, and simplicity,” as one of his fellow journalists commented. His wide appeal and heartfelt sentiments earned Pyle the Pulitzer Prize in 1944. Pyle went to Lincoln, and stood at a bar where Sheriff Pat Garrett had stood. He suggested that the entire town be made into a state or national monument. At Four Corners, he straddled the marker arched over on his hands and feet, so that he could say he had visited the four states simultaneously; then he circled the marker in his car so that he could claim he’d driven through those four states in record time. In the spring of 1938, the Pyles were invited to dine with Clyde and Carrie Tingley at the Governor’s Mansion, in Santa Fe. They ate fried chicken with their fingers and talked. Pyle described the Governor as “loud and blunt,” but someone “you enjoy listening to,” ungrammatical language and all. But he had some unflattering opinions about other aspects of New Mexico. Pyle did not paint a pleasant picture of poor Taos in the spring of 1938, before roads and streetlamps. The nicest thing he said about the old traders’ town was it was “rather picturesque.” And he commented that you could hang around for a month and never see an artist, because they lived there only a few months a year. The only “big name” artists who remained were Mabel Dodge Luhan (who was in New York when the writer arrived) and D.H. Lawrence’s widow, Frieda. His opinion of Santa Fe was even more disparaging. His main complaint was about the artists and authors who held inflated views of themselves, and whom he felt were “freaks and pretenders.” The New Mexican newspaper responded to his column by printing it in their pages without comment. His take on the capital was scathing, yet it roused little ire. Pyle was a difficult character who embraced Albuquerque but was critical of many other parts of New Mexico. Why do we have such an affinity for this man, who in his life published unkind things about Santa Fe, Taos, and the Indians—and who resided here in the state for only five years? Why have we named schools and libraries after him? I think it’s probably because Ernie Pyle was our link to the greater culture, a personage known to millions of fans, and who had touched the psyches of people worldwide—all that, and he favored Albuquerque. We know he found genuine friendship here, and loved the healthy lifestyle. When he did leave, he often pined to return. Albuquerque was an oasis in the stormy seas of the world he traveled and worked in. He became America’s soldier with a typewriter, a national hero at a time when we needed them; he even died a hero, on the battlefield. When in Europe, Pyle tantalized troops with stories about their home state when he learned they were from New Mexico. While involved in the most brutal Allied invasions of the entire war, he longed to be at his home with a view in the Duke City. 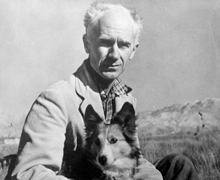 In early 1945, the writer’s birthday, August 3, was designated “Ernie Pyle Day” in Albuquerque. Jerry wrote that she wanted to get the yard in shape. She was looking forward—hoping—for him to be at home with her. But he would not be able to make it, because on April 17, as he was walking on the island of Ie Shima (now Iejima), just to the west of Okinawa, a Japanese sniper shot him in the head. His dark premonition had come to pass. He was 44.